Why is this result not a surprise? It is well known that natural decadal variations in regional weather can temporarily overwhelm any trends due to changes in radiative forcing. At any one time there will be places on the planet which are bucking the long-term trend. 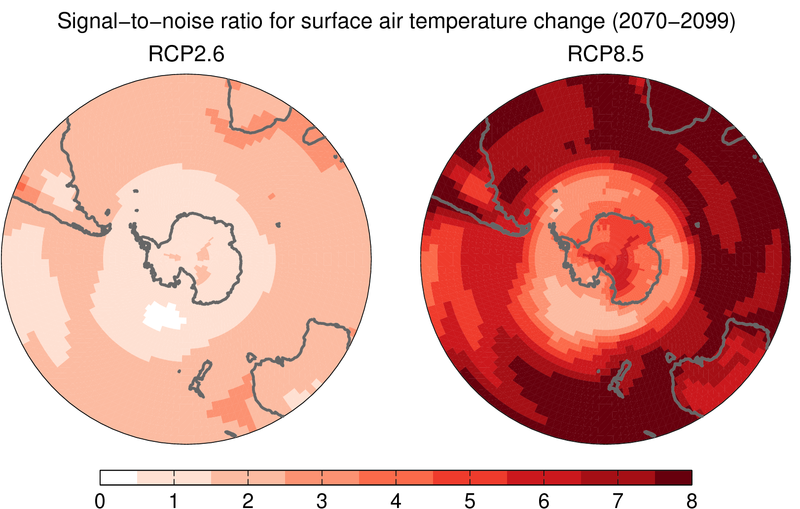 The GCMs therefore suggest that the anthropogenic signal in air temperatures is very slow to emerge from the noise of variability in this region – entirely consistent with what Turner et al. suggest. This region is also special because it is influenced by changes in stratospheric ozone which complicate the attribution of any observed trends. More evidence, if it were needed, that the role of natural variability is important when examining short term trends. The trend for 1979-1997 was 0.32°C/decade and -0.47 for 1999-2014. It would appear the trend for the whole period was negative, but I don’t have access to the full paper. There is data going back into the 1940s but not for every station. 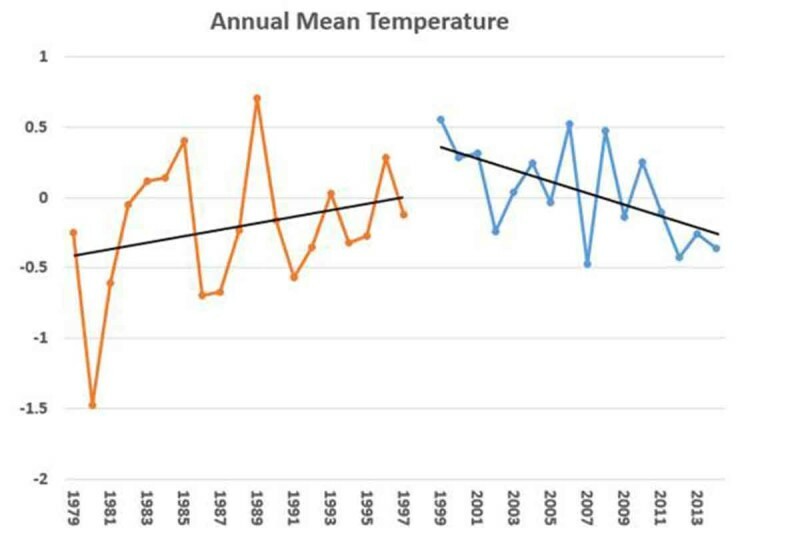 Eyeballing the temp data from the graph above, I calculated a slope for the 1979-2013 period of 0.1°C/decade. However, the p value was only 0.21, not significant. 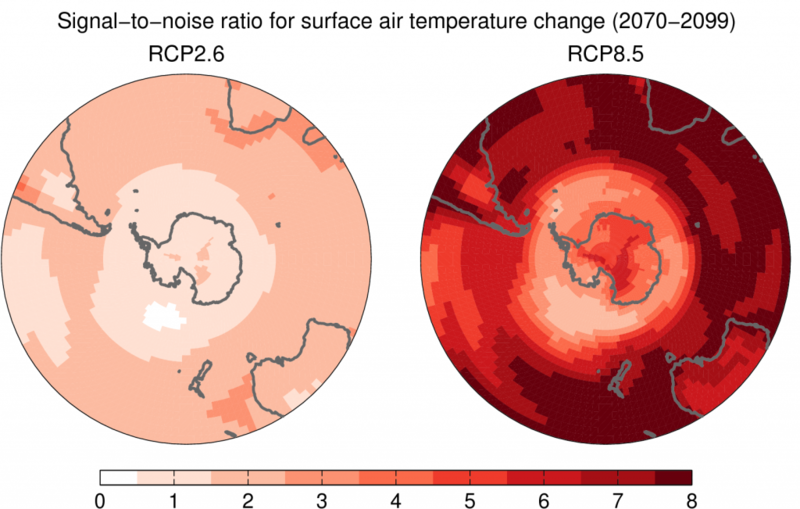 Comparing this paper with Alison Cook’s: As you mentioned, the Vernadsky and Rothena stations appear to show warming, whereas the others don’t. This would fit in with the Cook paper, which covered a bigger area and at greater depth (rather than just SST). The restricted area covered by Turner et al falls within the cooling area of the AP. It does not cover the West, South West, or South South West areas which show temperature changes of >+1°C. (SST) and +1.75-2°C at 400m. Given the limit geographical range of J Turner’s paper, I think it’s rather cherry picking to say that what is happening to the North and East of the AP is happening to it all.